Impressive and regal, the Mens Royal Tudor Hat is handmade of high quality floral brocade fabric patterned with shimmering thread for a look that is both extravagant and elegant, suitable for characters of nobility or royalty. The Mens Royal Tudor Hat is inspired by stylish hats of the Renaissance era, with a slightly puffed up crown and a moderately wide brim. A large white ostrich feather decorates one side of the hat, originating beneath a large fabric flower detail. 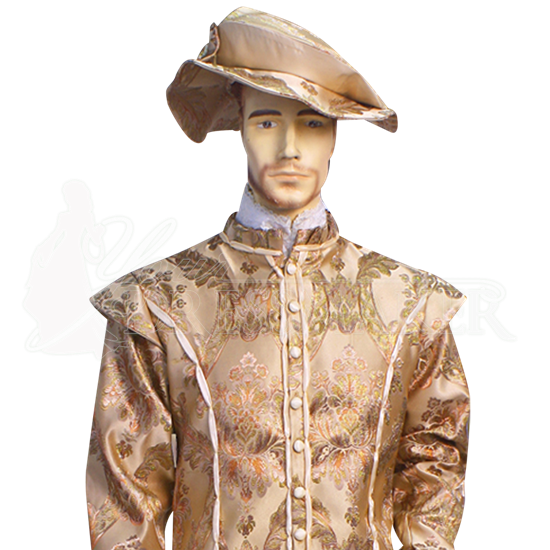 With its highly fashionable appearance and various color options, the Mens Royal Tudor Hat is sure to suit a variety of Renaissance, Baroque, and Tudor era styles, adding noteworthy flair to historic reenactment looks.